I don't know what you're doing reading these words, when you should be watching the above teaser trailer for William Chyr's Manifold Garden. Have you watched it? Crikey, it looks a bit special, doesn't it? Formerly known as Relativity (you can read the reasons behind the moniker change here), the beautifully named Manifold Garden is an exploration puzzler set in a 3D world that wraps around on itself. It started life as that M.C. Escher picture come to life, but Chyr says it's since expanded beyond that. 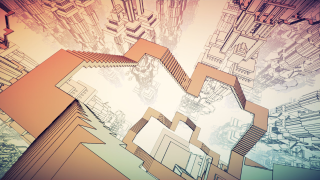 "Basically, in Manifold Garden, you’re a 3D being on the surface of a 4D donut," he explains in another post at the preceding link, and I had a lot of fun quoting that line out of context. Chyr elaborates over on the Playstation Blog. "You can travel in any direction, and you end up back where you started. Going down actually leads you back up. "A lot of the puzzles in the game involve exploring how physics behave in such geometry. What happens when you drop a cube off the edge? You’ll see it come back down from above, and you’ll also see it falling beneath you, at the same time." He recently introduced water into the game, which behaves as crazily as you might expect. "Like the cube, when water falls of the edge, it’ll come back down from above, except since it’s a continuous stream, you actually get a waterloop!"